Inspired by time the artist spent in Rome, the exhibition starts with a pine cone, a tree burl, a table piled with wood, and more. WORCESTER — At first glance, Jill Slosburg-Ackerman’s new installation at the Worcester Art Museum looks humble and cluttered. Small framed drawings, photos, and more fill a vast wall. A pine cone sits on a table; a tree burl partly bitten into by the artist’s blade sheds chips and sawdust. There’s an empty stretch of carpet, a cushioned bench. The artist has taken a saw to a cheap end table or two. But is this an art installation – or the dregs of a yard sale? “Jill Slosburg-Ackerman — In Rome: The Pine Grove. And. Natura naturans; natura naturata” clears unexpected pathways among these objects, and along the way uncorks the frothy ferment of imagination’s process for the viewer to take in. The last, Latin part of the title refers to the writing of 17th-century Dutch philosopher Baruch Spinoza, and distinguishes between nature as its own agent and as a passive part of some larger agenda. “In Rome” posits that nature and art are all part of the same creative force. Slosburg-Ackerman, from Cambridge, began her career as a jeweler, then enlarged her scale to sculpture. Her work foils expected frames of reference, exploding dichotomies between nature and culture, organic and man-made, 2-D and 3-D, art and — for lack of a better term — not art. For her, everything’s art bait. She’s a follower of Robert Rauschenberg’s exultantly democratic use of materials, transforming old, used furniture into sculpture. She pimps out frames and plinths so they compete for attention with the drawings and sculptures they support. The inspiration for “In Rome” began during Slosburg-Ackerman’s stint as visiting artist at the American Academy in Rome in 2009. Roman pine cones caught her eye, and she made studies. A pine cone is the starting point for the installation, and it’s a beauty, big and round. It perches on a low cloverleaf table with some leaves folded down, so the table points like an arrow into the rest of the exhibition. But the pine cone is not alone there. Beside it squats that magnificent tree burl, which the artist has carved into, and a low table with a half pine cone sprouting fungi at its edge, and another table precariously piled with shards and blocks of wood. Then, too, a flat wood panel on the floor, framed, and painted school-bus yellow. This grouping alone is a box of goodies. 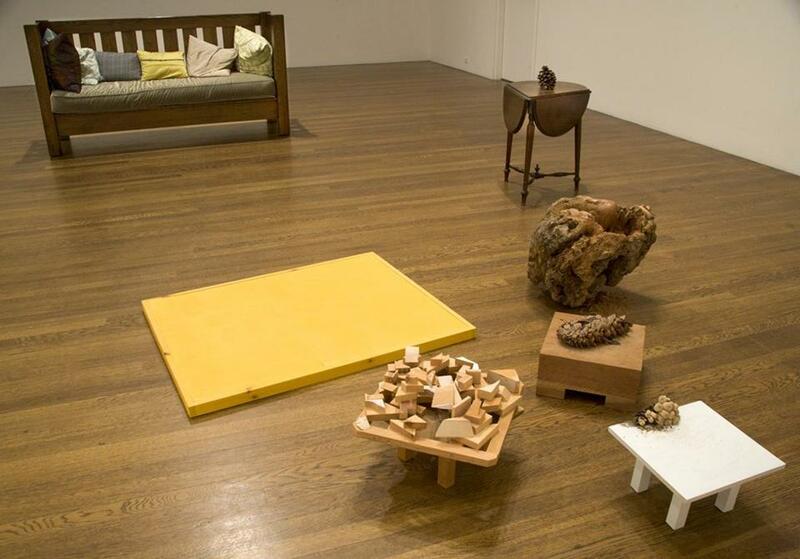 Everything is wood, and the shared material prompts connections: There are formal links between the pine cone and the pile of wood blocks, between the tables and the painting on the floor. On the wall, and on a divider sticking out from it, drawings of pine cones mingle with drawings of the colorful patterns on the stone floors of medieval churches. The kinship is easy to trace between nature’s ingenious patterning and the designs of humans. Photographs are cut and woven together to echo the patterns Then there’s a small video of a forest floor, flickering with shadows. They all are part of this whole, each a wisp of an idea that when joined with the next and the next becomes a tapestry, illustrating the journey of its own becoming. A carved wooden hemisphere pops off the surface of one drawing, flouting conventions of two-dimensionality. Some pine frames are painted white, some have been gouged to a feathery, pale surface. Some hang on hinges and stick out from the wall. On others, the artist has affixed fragments of old, far more ornate frames, as if she’s clinging to history, or trying to reconstruct it. The artist has worked with history often in recent years, showing her contemporary sculpture in historic houses. Those works interpreted the historical context, elucidating social constructs of the time. The underlying idea — that every era’s mores and expectations, which seem so set in stone at the time, will transform — fits with the generative message of “In Rome.” Everything, constantly, transforms. The installation ends with sculpture fashioned from two end tables, the type you might buy at Target and assemble yourself: particle board and wood veneer. One, mostly intact, acts as a pedestal for the other, which is another precarious stack of rough remnants, like jigsaw puzzle pieces — a callback to the pile at the beginning of the installation, which in its own way is a callback to the pine cone. Here, the stack is largely concealed behind a board, but there’s a mirror on the wall behind it, so we see it in reflection. It’s a bit like peering into the magician’s hat, looking for the rabbit. We see our reflection, too. After this ruminative romp, following this strand and that along Slosburg-Ackerman’s trail in which history, culture, and nature merge in a creation myth that’s still and always occurring, she brings us back to self-reflection. “In Rome” is interactive only in the way that all good art is: It invites deep looking. But as it limns the wild, associative process of the artist’s imaginative journey, it prods the viewer on his or her own.